Google acquired YouTube back in 2006 because they see that it will become one of the most visited websites in the world and today it is ranked number 3 after Google and Facebook. Being able to access and view millions of free video clips by streaming on your computer is interesting but definitely annoying when you are constantly experiencing the buffering problem. Basically buffering means that it requires to download more parts of the video so that it can be played and during that time the video will be automatically paused. If you have a very slow or unstable Internet connection, you are probably a victim of the video buffering problem. A solution to solve this problem is to subscribe to a faster Internet connection with at least 1Mbps. If you already have a broadband connection faster than 1Mbps, then make sure that no one else including you on your network is sucking up all the bandwidth by downloading files when the video is being streamed to your web browser. The other possibilities are your ISP does not have a good route to the server hosting the video or the server itself does not have sufficient upload bandwidth to allow you to download in full speed. Fortunately there is still something you can do from your side to speedup and accelerate the video streaming which will lower the occurrences in buffering. When a video is being streamed to your web browser, most if not all of the time your browser only uses one connection to pull the video. Theoretically by using multiple connections just like a download manager, the video will finish downloading much faster and prevent the need to buffer. We found 2 software that claims to accelerate video streaming. This program has been around since 2007 and is still actively being maintained. Speedbit Video Accelerator uses its own technology to simultaneously download from multiple sources instead of just relying on one source. This will result in downloading the video much faster to prevent buffering. They offer an unlimited free to use and a paid premium version with HD and iTunes acceleration support. The official website list a total of 138 sites including YouTube, Facebook, MetaCafe, DailyMotion, MySpace, Veoh, ABC, Amazon and many more that are supported by SpeedBit Video Accelerator. The list of supported video sites may not be up to date because t5m is on the list but website is no longer available. Using SpeedBit Video Accelerator is really easy because it works right out of the box after installation without require to configure anything. Just make sure the program is running by referring to the program icon at the notification area and then visit the supported video websites from your web browser. You will notice the arrow icon animation when SpeedBit Video Accelerator is accelerating the video. 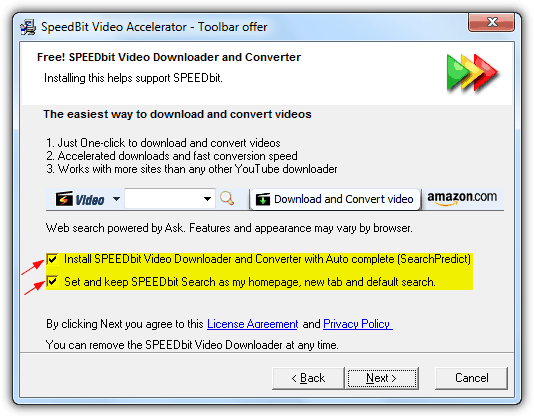 Do take note of the installation where by default it installs SPEEDbit Video Downloader and Converter with Auto Complete (SearchPredict) and set SPEEDbit Search as your homepage, new tab and default search. Simply uncheck both checkboxes, click Next and then click No on the confirmation window. bywifi is a free video accelerator program that was last updated 2 years ago. Unfortunately the official website is no longer accessible but the program can still be downloaded from Softpedia. Other than just speeding up the video transfer, it can also download and transcode the downloaded videos to a different video format. bywifi requires no configuration and will work immediately after installation. The bywifi tray icon at the notification area will also animate during the process of speeding up the video stream. Editor’s Note: When we tested bywifi few years ago, one of our test shows a positive result with a video in YouTube finished downloading in 35 seconds when it normally takes about 85 seconds without bywifi. However nowadays it seems that YouTube has improved their delivery in video stream by using CDN where the video are pushed from a server that is closest to you. Next, the initial stream seems to transfer at full speed until it reaches about 30% and then slowly comes to a halt. It will then continue to transfer at a lower speed when it detects that you’re still streaming the video. I believe this streaming method aims to save both YouTube’s and your bandwidth plus allowing the video to start streaming as soon as possible. If you are still experiencing buffering problems in video sites such as YouTube, you can give both accelerator programs a try. The latest version for Bywifi Video Streaming Downloader is 1.5.0. This version consists an interesting feature, which is “video dialog leaves webpage”. I think that a very interesting function. It is wonderful being able to minimize a browser by displaying only the video screen. bywifi published a Brazillian Portuguese version last week! Wonderful! It can download realtime video streaming from justin_tv!!! I can save my favor NBA games! Yes. It can speed up a lot for video streaming. Thanks Ray,very good product! It accelerates ok! It only works in Internet Explorer for me, it even works in Ashampoo Clipfinder!!! I would like to thank you Raymond for your great help. Tried ByWifi with Internet Explorer and Firefox it works great !! wow that’s a great stuff! !